Everything, absolutely everything you’ve ever wanted, now lies within reach! Of course… you still have to reach. You see what I mean. So I have been bathing myself in messages from The Universe. I have talked about my hopes and dreams with friends and felt that when things were right I would know. I now know . At the end of January I entered a Facebook contest promoted by Down Under Answers in conjunction with Tourism Western Australia and Virgin Australia to win a selected bucket list adventure. I had chosen Swimming With the Whale Sharks somewhere off Exmouth. Tuesday I came to work to an email from Down Under Answers (www.duatravel.com) – I won my bucket list trip. To say I was stunned and shocked is an understatement. 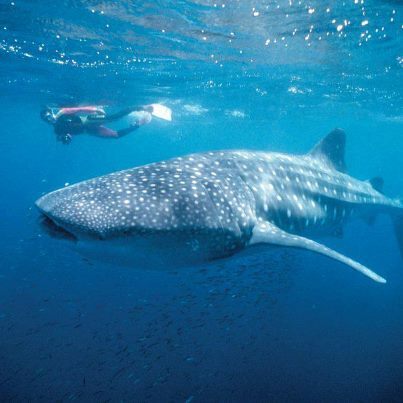 The trip itself is for two from Los Angeles to Perth via Virgin Australia; airfare to Exmouth; two nights Terrace Hotel Perth; three nights Novotel Ningaloo, Exmouth and three nights aboard Shore Thing, Sail Ningaloo on a Whale Shark Wildlife Discovery Tour. I have to do this between April 1 and July 31, 2013. Ask me if I’m excited! I think this is the sign and message I have waited for. I think it is time to make a drastic change in my life and start my travels with this trip. I don’t believe I will take that return flight. I really think this is it. I have a couple of months to get this organized and then I am just going to leave. Take a 6 month unpaid leave of absence and see where I get to. Whoo hoo Universe. Thanks for the sign. I finally get it! This entry was posted in Australia, travel, Uncategorized and tagged Australia, contest, travel, Virgin Australia, whale sharks. Bookmark the permalink. I love it! It always seems that when you’re not sure which direction to go, somehow the Universe gives you a small hint as to where to place your first step….or in this case, a big hint! Congrats and ENJOY THE TRIP! I can’t wait to hear about swimming with whale sharks. That is definitely on my bucket list too. Thanks for your good wishes. I will definitely be posting about the trip. Thanks Deb. It is indeed Look out World! Thanks for your encouragement.